Sew Hip, Modern Quilting, Handmade Fashion and Simply Beautiful are now owned by Derek Barnes, trading as Craft Magazine Shop. CMS head office is based in Cambridgeshire with subscriptions and Ad Sales being managed by a London agency. The team working on Sew Hip and Modern Quilting are mostly all called Jen, 3 of the Jen’s worked for the previous publisher of the magazines but Jenn Smith-Clarke, our new editor, is new to the company. We also have a new editorial assistant starting in July and hope to meet many of our readers either by email or in person over the next few months. 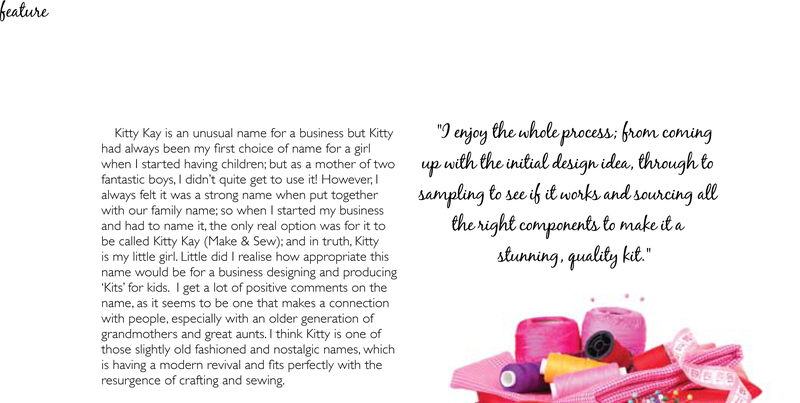 For any more information on Sew Hip you can email info@craftmagazineshop.co.uk or phone 0207 458 4420. Some big changes are planned by the new publishers, we will be redesigning and revamping the magazine completely from issue 43, and partially from issue 42. The snippet shown below is an example of one of the newly designed pages in issue 42, we are all very excited to show you what we have planned in issue 43 and beyond.